Do surveys devalue real feedback? — Toister Performance Solutions, Inc. Okay, besides being a little blurry? 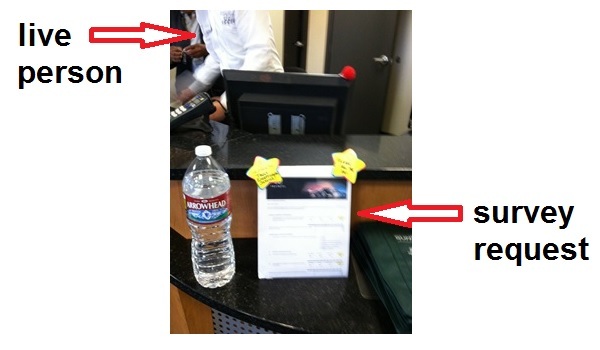 The problem is the sign that’s placed in front of the register. It’s asking customers to fill out an online customer service survey. The survey, which arrived via email a few days later, contained a whopping 36 questions. I’ve previously written about this ridiculous survey. Why can’t I just give my feedback to the person standing behind the counter? Survey inducements like this at the point of transaction are everywhere. They’re printed on the bottom of our receipts. We’re asked to hold the line for an automated survey after calling a toll-free number. I recently saw a sign in front of a register with a QR code that you could scan with your smart phone to complete the survey right then and there. And then there was this sign was at the checkout stand in a grocery store. It led to a Seinfeld moment where I wondered whether or not I had insulted the checkout clerk by not ringing the bell. All of these feedback requests seem to discourage us from providing our feedback directly to the person serving us. Missing out on this opportunity can be a costly mistake. Customers are being inundated with surveys. What’s worse is the surveys are often too long, ask poorly-worded questions, and don’t result in meaningful changes. In some cases, the drive to get more responses leads to some bizarre behavior. I was recently accosted by a store employee named Jacob asking me to fill out a survey about the service he provided. He even wrote his name on the piece of paper he handed me with the survey instructions. The problem with this scenario was my only interaction with Jacob was when he asked me to complete the survey. I had actually been served by someone else. In a recent post on the CX Journey blog, guest poster Sarah Simon advised companies to “put the customer’s need for peace and quiet above your need to drive higher response rates.” The post outlined some excellent steps for ensuring a voice of the customer initiative was actually a good experience for the customer. Smart companies incorporate closed loop feedback into their survey process so they can reach out to unsatisfied customers and solve problems. A colleague of mine recently used a survey to share her displeasure with being charged $20 to repair an $80 necklace she had purchased from a department store just five months earlier. The store manager followed-up via email to apologize and let my colleague know that the $20 repair charge had been refunded. The survey helped the store recover from a service failure, but there were opportunities to fix the problem sooner. The store could have had a policy that made these types of repairs free. My colleague expressed her displeasure with the repair charge to the sales associate who rang up the repair, but that person didn’t take any action. A survey should be a safety net, but not the primary means for identifying and resolving problems. Waiting to capture customer feedback via a survey can also increase the cost of resolving a problem. Years ago, I experienced a service failure at the Sir Francis Drake hotel in San Francisco. A simple apology would have sufficed at the point of contact, but that didn’t happen. The ultimate cost of recovery after a few bungled attempts to make it right was a three night stay in the hotel. Recovery costs rise because customers feel increasingly wronged the more time and effort they expend trying to get a problem resolved. Upset customers also provide negative word of mouth by sharing their story with others. Yes, a survey is a nice way to collect feedback, but it’s much better to have employees focused on spotting and solving problems immediately. I’m a big fan of surveys and acknowledge their importance as a tool for continuosly improving customer service. And, as an excellent post on the Help Scout blog recently described, there are ways to do surveys right. I just happen to be an even bigger fan of the person serving me taking care of business right then and there.